Icon changer!! Wallpaper changer!! Personalization launcher app!! Say good-bye to your default boring icons!! You can customize icons with Neon Fire Weed Skull icon pack. Neon Fire Weed Skull theme support Facebook, Twitter, Instagram, Messenger, LINE, Gmail, Chrome, Google, Photos, YouTube, Camera, Calendar, Music, Maps, Weather, etc. Not only icons, you can change the home screen wallpaper with this Neon Fire Weed Skull to make your screen more unique. Except for Neon Fire Weed Skull theme, there are lots of themes you can find. Ex) Unicorn, Kitty, Panda, Car sports, Skull, Graffiti, Girl, Bling, Bowknot, Diamond, Love, Pink, Silver, XS, Galaxy, etc. 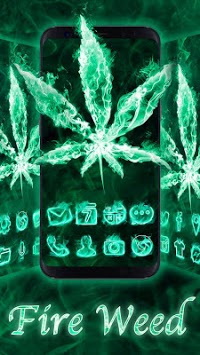 Neon Fire Weed Skull Themes HD Wallpapers 3D icons also offers large variety of ihd wallpapers and backgrounds. Wallpaper for girls, Wallpapers for boys, some wallpapers install special effects, like 3D Parallax, Live, GIF, Glitter (Bling Blink), etc. Neon Fire Weed Skull theme contains 10+ types of 3D animation when you swipe homescreen. All 3D animation(transition) are available for almost all Android devices. Ex) Samsung Galaxy S9, Galaxy S8, other Samsung Galaxy series, Huawei, OPPO, Mi (Xiaomi), Vivo, HTC, LG, Sony Xperia XZ, etc. There are many useful shortcut icons on Neon Fire Weed Skull theme home screen. Ex) Battery, Junk Cleaner, Boost, CPU Cooler You can always make your phone efficient and smooth. Easy to find every app on your phone with this quick search bar. It also suggest top sites and apps you will use frequently. Ex) Facebook, Google, Instagram, ebay, Twitter, YouTube, Amazon, Wiki to help you access these sites fast, smooth, efficient. Protect your privacy😎 You can lock the apps you want to secure. Ex) Whatsapp, Instagram, Twitter, Facebook, Contacts, etc. You can protect them with password you set. 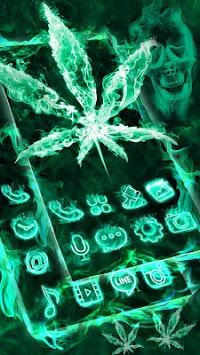 Neon Fire Weed Skull theme make your incoming call more fun when you hang phone. Able to customize incoming call screen. To eneble Neon Fire Weed Skull theme, you need to install Color Phone launcher first.